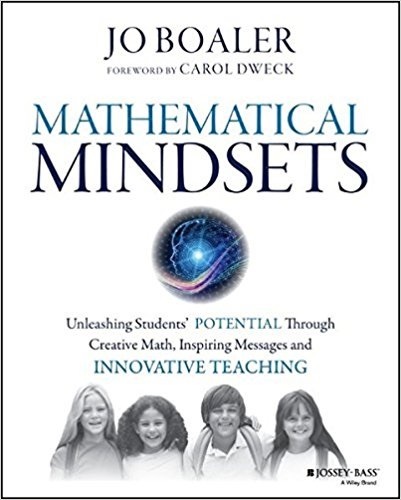 Mathematical Mindsets: Unleashing Students’ Potential Through Creative Math, Inspiring Messages and Innovative Teaching by Jo Boaler with Forward by Carol Dweck starts with the premise that math is the subject most in need of a makeover. Jo draws on modern brain research to show how changes in teaching and parenting can change students’ mathematical pathways. Click at the bottom on any page to get this book for parents and people in your school in charge of math instruction. Jo is a British education author and is Professor of Mathematics Education at the Stanford Graduate School of Education. She is involved in promoting math education reform and equitable mathematics classrooms. She is the CEO and co-founder of Youcubed, a non-profit organization that provides mathematics education resources to parents and educators of K–12 students. She is the author of seven books including, What’s Math Got To Do With It? and The Elephant in the Classroom. Her book, Experiencing School Mathematics won the Outstanding Book of the Year award for education in Britain. Currently, she is the Research Commentary Editor for the Journal for Research in Mathematics Education. Jo starts with explaining the power of having a growth mindset as opposed to a fixed mindset. This is centered on the work of Carol Dweck. Be sure to read my summary of Carol Dweck’s book Mindset: The New Psychology of Success – How We Can Learn to Fulfill Our Potential. It will help you to decide if you wish to purchase it and to review the key concepts after you read it. Teachers and parents are key here in that they are responsible for telling students that intelligence is not something fixed at birth. They should also avoid sending the message that only some kids are good at math. Jo believes that there is no reason that about 95% of all students can take calculus in high school. She also points out that there should be no preordained pace for learning math. This entry was posted on Monday, January 25th, 2016 at 7:22 am	and is filed under Book Summaries, Education Books. You can follow any responses to this entry through the RSS 2.0 feed. You can leave a response, or trackback from your own site.